The Palace of Westminster and Westminster Abbey including Saint Margaret's Church are representations of English Gothic art, and symbols of parliamentary monarchy. 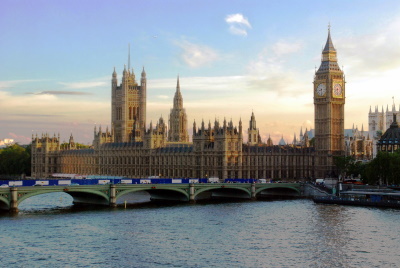 Westminster Palace is the Seat of Government and includes the famous Clock Tower Big Ben. The Gothic Palace was built (or rebuilt actually) in the late 19th century. 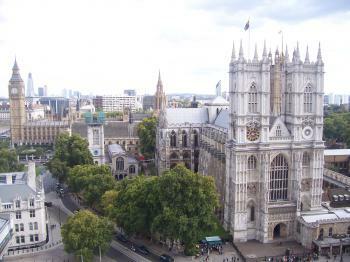 The Westminster Abbey is a glamorous Anglican cathedral that stands North of the Palace. It dates from the 13th century, and holds the tombs of almost all kings and queens of England. It's also used for coronations. St. Margaret's Church is a small medieval church, part of the Westminster Abbey Complex. My first trip to London was in 1987. At school you could choose between Berlin, Paris and London as destination for an educational trip. I chose London because it seemed to be the most modern and lively of the three, and also because I was quite into English pop bands at the time. According to the pictures I have we visited Buckingham Palace and the Big Ben. Several trips followed this one, but I haven't done much sightseeing in London. I probably was too busy browsing bookshops and record stores. Only in 2016 I 'touched' this site again, putting Westminster Abbey on the to do list of a day trip to London. My visit started with queuing some 20 minutes in one of the two lines that lead up from the sides to the North Entrance. Upon entering I was spoken to by one of the vergers. After enquiring where I came from (she did not ask whether I came to worship by the way), this friendly elderly lady said she was sorry that no audio tours in Dutch were available. So I settled for one in English. It’s good that one is provided within the entrance fee, though I wasn’t really impressed by its explanations. It does not go much beyond “This is a church where many famous persons are buried and hey, there’s a throne used for coronations too”. My suggestion for improvement would be to be able to select stories from different angles, so as to learn more about the architectural history of the church or Anglicanism (as this will be the only Anglican church most foreign visitors will visit during their whole life). My lasting impression of Westminster Abbey is that of a monumental graveyard, confined within the limited spaces of a Gothic building. Besides the numerous UK royals and politicians, also scientists such as Newton and Darwin are buried here. It almost feels like sacrilege to step on their graves. But the real reason for her interest is that it is the burial place for Edward III. She’d taken one of those genetic ancestry tests and discovered she was descended from King Edward III. I didn’t break the news to her that something like 80% of the British population alive today can also claim the great Edward III as an ancestor. When we visited, the Abbey was absolutely mobbed with people undeterred by the rather hefty admission fee (£22+). We’d recommend it if you’re in central London. It’s one of those places to see once in your lifetime, but you probably wouldn’t ever go back unless you’re a die-hard Anglophile. This is iconic London: the Palace of Westminster with its distinctive Tower of Big Ben, set against the River Thames, and the nearby Gothic Westminster Abbey, site of coronations and the final resting place for not just members of the royal family, but some of the world's best and brightest. Every time I visit London, I make sure to walk past these buildings steeped in history. Unfortunately, while I have been able to visit parliaments in other parts of the world, including Canberra, Ottawa, Berlin, and even Edinburgh, I have yet to visit London at a time when I could take a tour of the Houses of Parliament in the Palace of Westminster. I hope to rectify this some day. I have made my pilgrimage to the magnificent Westminster Abbey next door, though, and it has a spectacular array of British history buried within its walls. Here lie notable royals, including James VI, Elizabeth I, Mary I, and Henry V. Here also are the graves of writers Charles Dickens, Rudyard Kipling, and Alfred, Lord Tennyson; the musician Georg Frederick Handel; the explorer David Livingstone; the abolitionist William Wilberforce; and scientists Charles Darwin, Sir Isaac Newton, and Sir John Herschel, amongst others. I have not seen the inside of Saint Margaret's Church, which is also inscribed in this World Heritage Site, but I plan to on my next visit to London. This World Heritage Site is essential London. 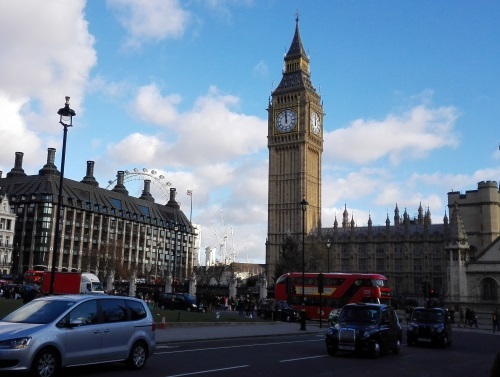 Logistics: The Palace of Westminster, Westminster Abbey, and Saint Margaret's Church can be reached by tube via the Westminster Station (Circle, District, or Jubilee lines); by bus (including routes 11, 12, 53, and 159); or by foot for those already in central London. The view from The London Eye is highly recommended. It's one of the most iconic sites in London so it's no surprise that it's a WHS many people have ticked off. But unfortunately it is much harder to get inside than see it from the outside. I would love to see more regular tours and easier access. I think of Australia's Parliament House in Canberra and the fact it is always open and free and there are no queues. That's how a 'house of the people' should be! I undertook work experience with a Member of Parliament in June 2006, so had the chance to see David Cameron debate Tony Blair in the House of Commons. In March 2015 I was invited to visit again, this time taking more time to appreciate the oldest part of the building, Westminster Hall. This was where from the 11th century the earliest parliaments were called by the monarch, usually when he needed to raise a tax to pay for a war. 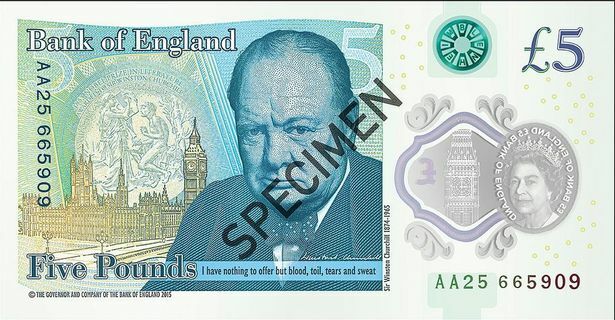 We paid the ridiculous £18 per person charge to enter Westminster Abbey in April 2015. Although not a cathedral, it is as grand as any in the land and more important than most. The East Face can be appreciated for free from the outside, but you must go inside to see the tombs of many an important monarch or historical figure (including Henry VII, Richard II, Elizabeth and Mary). The smaller St Margaret’s Church next door is free to enter and a lot quieter. 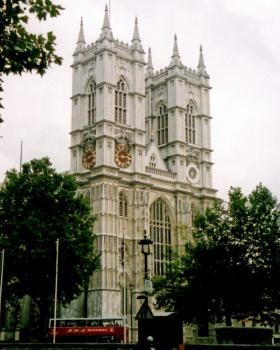 Since Westminster Abbey was originally a Benedictine Abbey, a church was required for the day-to-day worship of parishioners in Westminster. 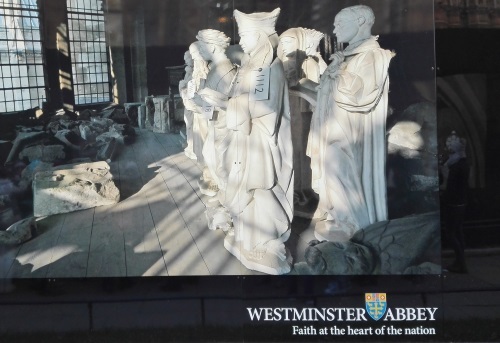 I visited all the associated sites of Westminster in June 2013. Maybe I was lucky but there weren't any long queues to be seen. 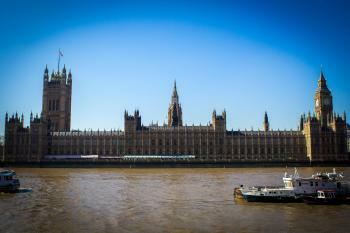 The Houses of Parliament and Big Ben are simply gorgeous day & night and from every angle or point of view. Westminster Abbey's outstanding value surely lies in its historical and cultural importance, while St Margaret's Church was very interesting to visit. London's top WHS hands down, no doubt about it. Certainly, the Houses of Parliament is a must see. All tourists take photos from the Westminster Bridge or the opposite bank of the Thames. My photo is from the inside of a pub across the street. If you are in London during the Summer Opening, you should take the opportunity to visit the interior of the Parliament building (recently, there are also tours on Saturdays throughout the year, I think). It is worthwhile despite the long queues at the ticket counter. But I would recommend to order a ticket in advance via this website. This was very convenient, we just had to be at the entrance about 15 minutes prior to the start of the guided tour. We took a tour in English, but there are also tours in other languages. The tour includes the most important areas of the Palace: Westminster Hall, the Robing Room, the Royal Gallery, Lords Chamber, Central Lobby, and the Commons Chamber. It was great to see all these famous rooms that are so full of history. The Houses of Parliament are very different from other parliament buildings in Europe, in particular the Common Chamber. It is a relatively small rectangular room and the two political parties sit opposite each other. The tour was one of the best guided tours I've ever attended. Our guide was excellent, he told many interesting facts about the building, the English history, and he described in detail the traditional State Opening of Parliament. This is a traditional ceremony, full of historical references and quirky rituals, as it is typical for England. It is the only occasion on which the monarch enters the Palace of Westminster. Before the ceremony, there is a ritual search in the cellars of the Palace. This is done in remembrance of the Gunpowder Plot in 1605. It is also a tradition, that a member of the Common Chamber stays as a hostage at Buckingham Palace during the monarch is in the Parliament, to ensure the safe return. I love such stories. Westminster was one of many highlights of our two weeks in London. This is must see site when in London. So much history associated with the Abbey, not to mention so much to see. At six pounds the 'entry fee' and guided tour is well worth it. Just don't go on a Sunday because the Abbey is closed to tourists thanks to normal church services. 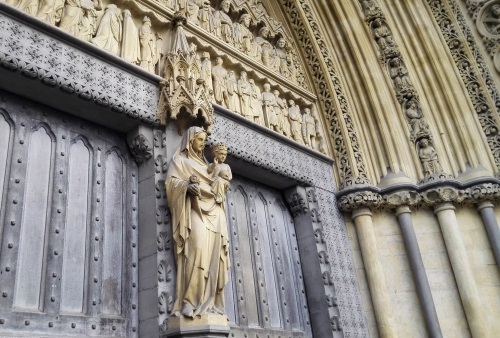 I recently visited Westminster Abbey with my family last November. It was probably one of my favourite places that i went in the whole of Europe. I was looking at all of the tombs from the royals and it was amazing to recognise the names from my history text books. As i am still at school, i was only just learning about these people and how they influenced the way england is today. I was able to email my friends and say, "you know that person we were learning about in history, I just visited there tomb." It was amazing and it made the history so interesting when i got back to school. The only dissapointment was that you are not allowed to take photos but that is understandable as they are trying to show respect and also photography can damage these historical artifacts. I serously reccomend Westminster Abbey to anyone travelling to the UK. This was London’s first World Heritage site and in my mind its finest, it really should not be be missed. 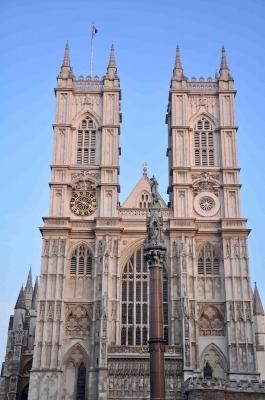 The original proposal was for just the Palace of Westminster (Houses of Parliament) but it was sent back and asked to include the Abbey to show the Architectural influence, the Abbey being Gothic and the Palace Neo-Gothic. I truly love the Houses of Parliament; I may be a little biased as I study Politics, however I can’t think of a single building in Europe I find more impressive than this. The façade is perhaps the high point of Neo-Gothic architecture, built after a fire in 1834, it features perhaps the most iconic symbol of Britain; Big Ben (this is actually the name of the bell housed inside the Clock Tower but everyone calls the tower Big Ben and to be fair so do I) The current Palace does however contain part of the original structure in Westminster Hall which was built in 1097 the roof of which is viewed as being the best surviving example of medieval English carpentry. If you are lucky enough to get inside then the level of detail is awesome and many areas are opulent, these are the details that normally bore me rigid in Palaces and Stately Homes as they were mostly made for one particularly rich person or family, however in the houses of parliament these are made to help govern the country, and so I feel a real pride in seeing them. One thing that really struck me was how small the debating chambers are, especially the House of Commons, it is easy to see why this atmosphere creates the heated and charged debates that dominate British Politics! Also the decorations and etiquette teach you a lot about the development of democracy in Britain, for one the door into the House of Common’s has a large dent in it where the Monarch’s representative has the door slammed in their face and they have to knock/pound on it with a large Black Rod, this is because the monarch is forbidden to enter the chamber! Also you are not aloud to sit on the benches in the House of Commons, as they are strictly reserved for those that have been elected! All of this combines to give a fantastic history of democracy in Britain and I feel, being English myself, this is a much greater reflection of our values and history than can be gained by looking at the Stately Homes and Royal Palaces that are normally pointed to as being more important, so this is the site I would hope best reflects British history and culture at the highest level. So there is my treatise on that, but the site also includes the Abbey, which is justifiably one of the most visited churches in Christendom and the vaulting is immaculate, but it has been a long time since I have visited so I think a visit soon will be on the cards. If you want to visit the houses of Parliament then it can be tough, the only time to do this if you are not a UK citizen is when it is in recess – normally August and September, otherwise it can be very hard to get in, even for citizens of the UK who have to arrange a tour via their MP. However the site is right in the centre of London and should not be missed by anyone who visits even if you do just get to see the outside! Westminster is one of those unmissable (and not to be missed) sites that you just stumble across when you come to London and that you can´t escape - you come into London´s centre and there it is. However, it is also very interesting and should be visited even if it were far off the beaten track. Of course it isn´t, as the millions of other visitors easily attest to. Westminster Palace is a monument to democracy, maybe architecturally less interesting (except of course for Big Ben) from the outside, but the inside is really fascinating and you can do a guided tour that lets you see the Houses of Parliament (certainly in summer, not sure about other times of year when parliament is in session). St.Margaret´s Church is a small gem that should not be missed, but of course most people head straight to Westminster Abbey, Britain´s greatest religous building and a historical monument par excellence. It is the site of the coronation of the kings and queens of England since William the Conqueror claimed his new country´s crown in 1066, and also the burial place for most of them. There are numerous monuments and plaques dedicated to famous historical personalities, from Shakespeare to Mary Queen of Scots. Huge crowds, but still doubtlessly worth the visit. By the way, not too far away (toward Victoria Station) is Westminster Cathedral - not to be confused with the Abbey -, which is Britain´s major Catholic church. My single experience of Westminster Abbey, is that I wasn't allowed to sit and sketch the interiors without a permit! Otherwise, not terribly remarkable architecture. Yes, the history is the main thing. So a visit may be somewhat disappointing. i think westminister is a wonderful and extrodinary place to visit. 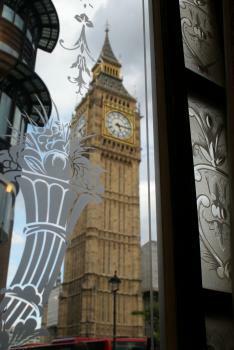 i just cam from my visit to the houses of parliment and the tower of london. i have been in the white tower and i really think it is interesting. When my child saw the gums and swords he says "wicked". i really liked it and i would like to visit it again. I visited this site in mid October 2002 during a brief official visit from the USA. Waited for just 5 minutes to get into Westminster Abbey. This site is a masterpiece with the tombs of Kings and Queens. The history dates back to 11th century! William the Conquerer's coronation was held in the Norman Abbey at 1066! The rose windows were very impressive. A definite must visit in London. Do go inside and explore. Worth every penny of the 6.00 pound entry fee. From "Westminster Palace, Westminster Abbey and Saint Margaret's Church" to "Palace of Westminster and Westminster Abbey including Saint Margaret's Church"
Architectural design competitions: Westminster Palace - Charles Barry won competition for reconstruction in 1836. Sundial: St Margaret's Church has 4 sundials. See description including how wall mounted sundials have to vary in type according to the direction of the wall they are placed on in this "Thames Sundial Trail" link (covers Sundials along the Thames Walk from Westminster to Greenwich)! Equestrian Statues: Richard the Lionheart (1856 - first shown at the Gt Exhibition). Barry, the Palace of Westminster architect, didn't want this statue placed here. Terrorist Attacks: On 22 March 2017 a terrorist attack in London began on Westminster Bridge, and continued into Parliament Square and the grounds of the Palace of Westminster. 5 people were killed. Treaties: The Treaty of Westminster of 1674 was the peace treaty that ended the Third Anglo-Dutch War. Diplomatic Missions of Joseon Envoy Min Yonghwan: 22 June 1897 (Lunar date: 23/5) Bright. Diamond Jubilee Celebratory Parade along the Imperial Route "I arose early, finished a cup of tea, and put on ceremonial dress. Together with both secretaries and our accompanying official, we went inside the palace gates. We paused there for a while, when suddenly from the palace twenty ceremonial cannon were fired. All the officials came out of the gates riding horses. After a short while the Empress appeared seated in a gold-wheeled carriage with a band marching in front. The princes, ministers, and envoys of each nation all lined up behind in columns and set off. At the sides were columns of horse guards wearing armor and helmets, holding their horses' reins in front of them and moving slowly. Soldiers bearing arms and standing close together lined the imperial route on the left and the right..On either side of the street the walls of the buildings were festooned with an abundance of ribbons and rosettes of every color. In addition, the entire imperial route was strewn with flowers. A sea of ten thousand people all took off their hats and cheered, 'Hoorah!' (a kind of mansei!). The sound shook the streets. The empress gazed around nodding her head. We travelled around one circuit." Protective engineering works against flooding: On 7th Jan 1928 Westminster Hall and the House of Commons were flooded in a storm surge. The Embankment was subsequently raised and ultimately the Thames Barrier was built. Consideration is now being given to building increased defences to cover the period after 2030. Historical Graffiti: Coronation Chair in Westminster Abbey: "Most of the graffiti on the back part of the Chair is the result of Westminster schoolboys and visitors carving their names in the 18th and 19th centuries. One of the tourists carved "P. Abbott slept in this chair 5-6 July 1800" on the seat." Prince Charles: Prince Charles took his seat in the House of Lords (Palace of Westminster) in Feb 1970 - he wanted to play an active part but was warned not to and has never spoken. Interestingly, such ceremonies as his christening and marriage(s) have NOT taken place at the Abbey. Painted by JMW Turner: Burning of the House of Lords and Commons 1835 etc. Henry Morton Stanley: Was an MP 1895-1900 (Liberal Unionist for Lambeth North). Lord Byron: Took his seat in House of Lords in 1811 - defended the Luddites and opposed the established church. Died in Athens (suburb now called "Vyron") but his embalmed body was refused burial at "Poets' Corner" in Westminster Abbey for reasons of "questionable morality". He eventually got a memorial there in 1969! Thomas Telford: Westminster Abbey - Buried (in the Nave) 1834. Homer B. Hulbert: During his final visit to Seoul in 1949, Homer Hulbert proclaimed, "I would rather be buried in Korea than in Westminster Abbey." Seven days after arriving in Seoul Hulbert passed away. His last wishes were carried out and his grave can still be seen in Seoul today. Homer Hulbert remains a revered figure in Korea. Queens and Empresses: Queen Victoria laid a foundation of the parliamentary archive tower which later named Victoria Tower after her. Geoffrey Chaucer: In 1556 Chaucer was the first poet to be interred in "Poet's Corner" inside the Abbey - He was buried there originally when he died c1400 not because he was a "poet" but because he was a tenant and parishioner of the Abbey (his reneted house was on the site later occupied by the Chapel of Henry VII). It is presumed that his body was re-interred in the Elizabethean tomb erected in his honour. He was also elected as one of 2 "knights of the shire" to represent Kent in 1386 ("The Wonderful Parliament") - the House of Commons then met in the Chapter House of Westminster Abbey. There is also a record of him being present in the Great Hall on 13 Nov in a court case. Naser ed-Din Shah: "To-day we have to visit the Bank, the Tower of London, the churches of St. Paul's and Westminster, as also the Houses of Parliament. .. It is a very grand, solid, and majestic structure. In point of fact, so great a palace is worthy and seemly for the Parliament of England." Reportedly haunted locations : The Abbey - Numerous reported ghosts from across the centuries include a WWI soldier near the "Tomb of the Unknown Warrier"
822 Community Members have visited.